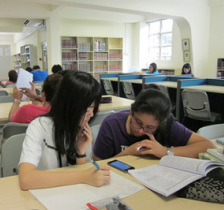 The MCKL Tan Sri Runme Shaw Library, located on Level 3, provides students with a comfortable and conducive environment for study and research. The Library is well-stocked with a collection of over 11,000 titles, comprising up-to-date textbooks, reference books and journals classified according to the Library of Congress Classification System. In addition, books for general reading, recreation and self-development as well as magazines and newspapers are also available. To complement print resources, the Library provides access to electronic resources such as online databases, online journals, e-magazines, e-newspapers and other resources. The Library provides a range of services and facilities to support research, learning and teaching needs. They range from book loan services to internet access and photocopying/printing/scanning facilities. Students can also make use of the desktop computers for research and assignment purposes. These services and facilities will be upgraded continuously, in line with our forward looking policy. The Library is managed by professionally qualified librarians and trained personnel who handle library matters related to circulation, loans, reference, general enquiries and ICT facilities. To ensure smooth housekeeping operations, the Library has adopted the iCloud library system, Virtua Chamo, a state-of-the-art library system that allows students and staff access to bibliographic records of the Library's resources via the Online Public Access Catalogue (OPAC). It also offers self-service facilities such as the checking of loan status, online renewal of books, generation of overdue notices via e-mail as well as online requests and reservation of books.